I was pleasantly surprised at the delivery of my Topbox on the 12th as I only received the shipping email on Friday, the 8th. The expected delivery was the 13th, and I usually receive my box quite a few days later. This is probably the fastest delivery I have received thus far since subscribing! We had the option to select a Prive box and you could be one of the lucky ones to receive a box on your wish list. I did not make a wish list for this month because I missed the deadline; wish I chose the Benefit box! But I do enjoy trying products from a range of brands just to see what is out there. – I had to look this cream up and apparently it is for menopausal/mature skin which I certainly do not have yet! It is supposed to improve the skin’s appearance by providing essential nutrients for extremely dry skin. The texture looks quite thick and it appears to have blue flecks in it. – I was quite excited to receive one of DL’s nail polishes. I already own a couple, so this would be a great addition. The colour is quite pretty; it’s a lovely blue/purple colour with pink glittery flecks in it. – This product looks promising. A product that will cut down blowdrying time? Yes! When settled, it is separated with a pink colour on the bottom and clear on top. Of course this means you need to shake it before you use it. After an initial spray, it smells pretty good. – It was nice to see a MUFE product in this month’s Topbox. However, it is a powder foundation which can be tricky to match skin tones when given a universal shade. Just looking at the colour in the container I can see that it will be a bit dark on me. What a shame! Maybe, just maybe I can use it in the summertime, but I hardly get tan so this product may not get much use. So there are 2, possibly 3 out of 4 products that I will be using from this month’s box. 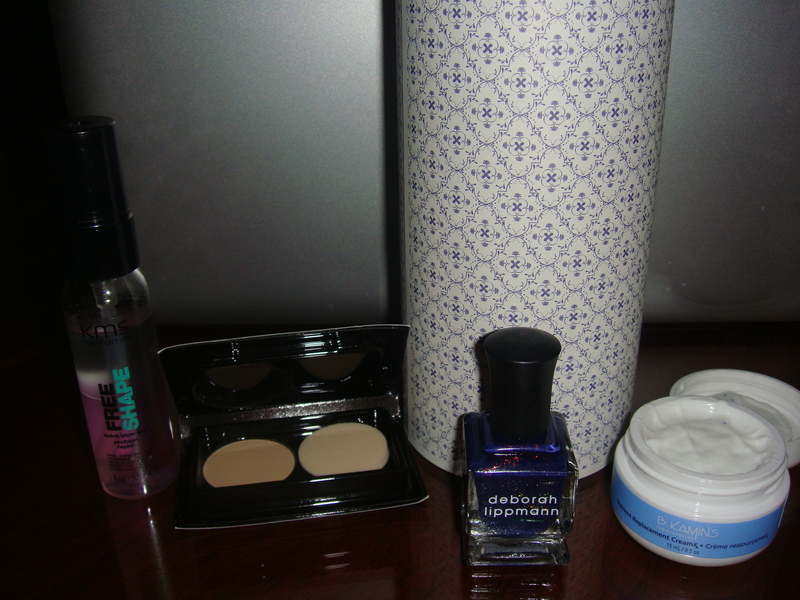 I was also hoping that maybe Topbox would include a little something extra as this is my birthday month. (Why else do they ask for your birthday in your beauty profile?!) Or just something because it’s Valentine’s Day… I guess that’s just wishful thinking. What did you receive in your February Topbox? I’m excited to actually try it out!